CLAIR F. HORTON, now superintendent of repairs at the Air Corps repair depot in San Antonio, began at Hammondsport in 1908 and eventually soloed in a Curtiss seaplane, June 15, 1914, in Winnipeg, Manitoba. Then followed long journeys about the country in exhibitions. 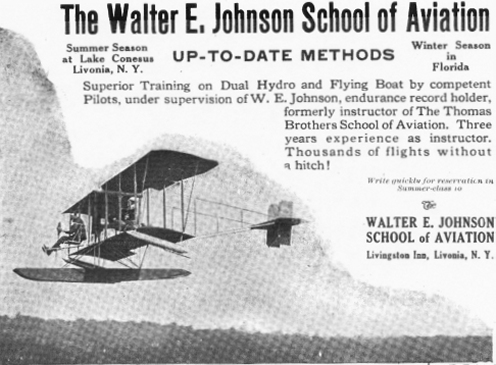 The Philadelphia Inquirer, of May 13, 1916, tells of the presence of Admiral Peary, the mayor and other prominent lights at the opening of the Philadelphia Aviation School at Essington, and shows the instructors as Clair F. Horton, Earl Beers, Jack Tweed and Walter E. Johnson, Jr.
From AERONAUTICS, June 15, 1914 Walter E. Johnson, with C. A. Herrmann, has incorporated the Walter E. Johnson School of Aviation, at Livonia, N. Y., with $10,000 capital stock. A school for water flying machines will be conducted at Conesus Lake where passenger carrying has been done since Decoration Day. All teaching will be done over water, with a hydroplane, dual control, and a flying boat, both Thomas machines. Mr. Johnson is assisted by Mr. Winnerly, one of his last year grads. Johnson has made a most creditable name for himself in the past years as a consistent and conservative flyer. He made a new American two-man endurance record of 3 hrs. 51 min.., on Oct. 31, 1912. Those entering at the new school will be sure of the best attention. Walter Ellsworth Johnson, 72, died in a Philadelphia hospital. 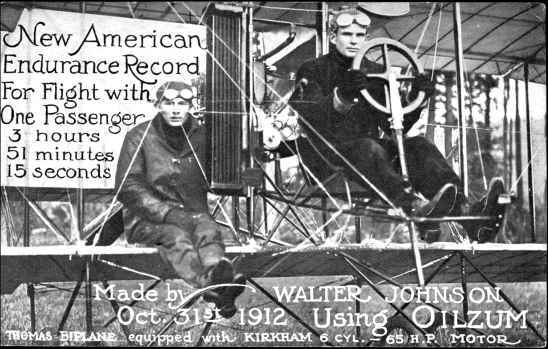 Mr. Johnson held the American Duration Record for 1912 for pilot and passenger --- 3 hours and 51 minutes. 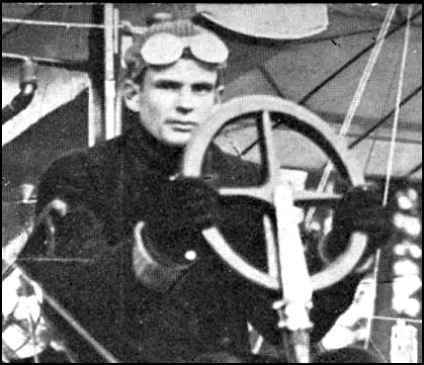 During World War I he delivered planes to the Russian government for the Curtiss Co. He was a first lieutenant in the aviation branch of the Signal Corps in San Antonio, Texas, where he was in charge of the instruction school. He later became an officer of the Camden Trust Co. In 1912 he was married to the former Florence Scrafford of Bath. He is survived by three children, Walter Jr, of Texas; Robert S. of Haddenfield, N. J.; and Elizabeth E. Harrison of Philadelphia; and four grandchildren.